A 2016 global survey by Salesforce Research showed that sales reps spend only 36% of their time actually selling. Where is the rest of sales’ time going? Tasks including training, traveling, and company meetings only take up 17% of sales’ time, but administrative tasks eat up a whopping 25%. It’s no surprise that 45% of sales reps cited excessive administrative tasks as their top challenge to selling, making sales management more important than ever. In many ways, the strength of a company relies on the strength of its sales team. If customer experience is the number one goal for high-performing sales teams, forward-thinking companies should streamline sales tasks like manual data entry and account maintenance by incorporating intelligent automation technologies so that sales teams can improve customer relationships and maximize profit and growth. Icicle’s robust Sales Management supports sales staff and customers, leveraging the whole organization’s data for sales research and analytics, and feeds sales information to other areas of the organization to increase efficiency and productivity across the board. Positive customer experience has become the mark of a successful business. Face-time with customers and in-depth awareness of their needs drive product innovation. If a company wants to stay competitive in an increasingly automated industry, they must reduce the burden of administrative tasks so that their sales reps have time to strengthen relationships with existing customers and find new ones. 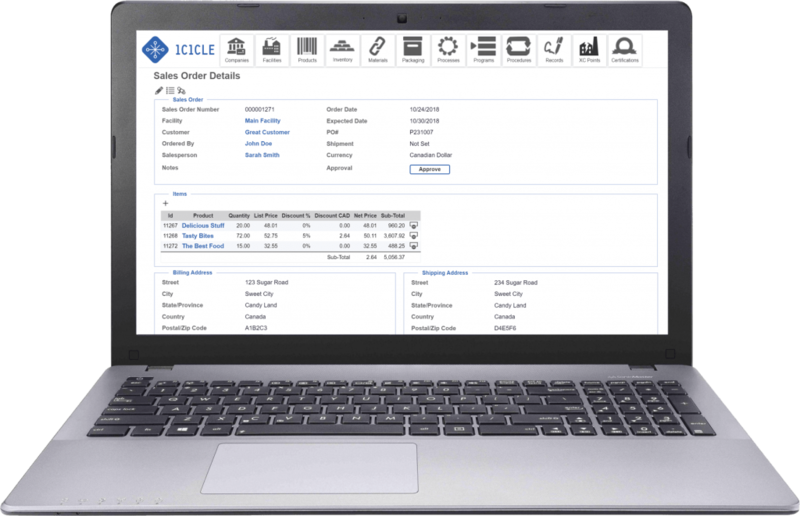 Icicle’s automation benefits sales teams with helpful Sales Orders, Master Order Forms, and Price Lists. Sales Orders are instantly generated with a user-friendly system of navigating to the list of purchase orders, then choosing the customer, order date, and facility. Customer profiles are created and Sales Orders can be intelligently pre-populated based on purchasing history to save time and reduce human error. Salesforce’s 2016 survey indicated that sales teams utilizing intelligent selling capabilities like Icicle’s sales features reported a 54% positive impact on customer/prospect nurturing and a 54% positive impact on the productivity of sales reps.
Icicle creates comprehensive records for Sales Orders. Sales Orders have been an Icicle feature since 2017, but the Icicle team has taken account maintenance and ordering to a whole new level with Master Order Forms. The top two reasons sales teams say they are unable to prioritize customer experience are (1) customers are not easy to track, and (2) the team lacks the required tools/software to track them. Icicle’s sales management mitigates these two concerns with Master Order Forms. Building on the Sales Orders interface, Master Order Forms display a grid with products at the top and customers down the side. Icicle’s smart algorithms preselect the 25 most likely customers and products to appear automatically, and any missing products or customers can be easily added. Sales orders are generated automatically and en masse as the sales rep enters the amounts ordered by each customer in the same simple grid. 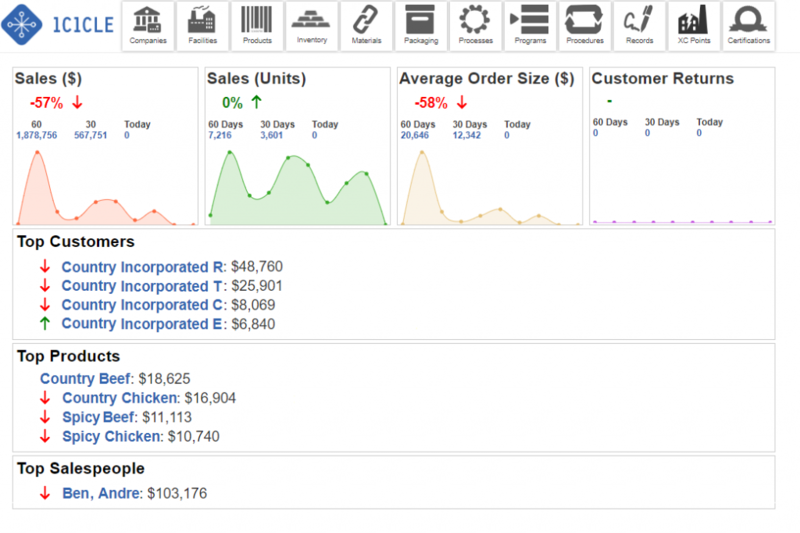 This feature creates sales orders for each client in seconds, then provides a daily overview of total sales. What would normally take a sales rep up to 25% of their day can now be completed in minutes, allowing them to get back to where they belong – with customers. Price Lists for all products can be general, limited time discounts, or customer-specific. Price lists can be used to pre-populate Sales Order pricing to ensure that customers are always charged the current price. Automated, intelligent price lists remove the necessity of a manual check by a sales rep, reducing human error while ensuring customers are able to take advantage of discounts for specified times without labor-intensive account maintenance. The 2016 Salesforce survey showed that the highest performing sales teams were 3.5 times more likely to use sales analytics than underperformers and 70% of sales professionals said that their close rates were significantly improved by sales analytics technology. This is no coincidence; sales teams that understand their sales health and can properly forecast for the future are better able to meet their customer’s needs, and happy customers are loyal customers. Icicle extrapolates sales data via the Trending interface to provide a one-stop-shop for sales analytics in the Sales Dashboard. Icicle’s Trending feature takes data collected by the Sales Order Interface and automatically generates graphs showing sales performance over time. Trending allows you to leverage data from your entire organization to strategize effectively and improve your programs. This information is collected in one place: the Sales Dashboard. 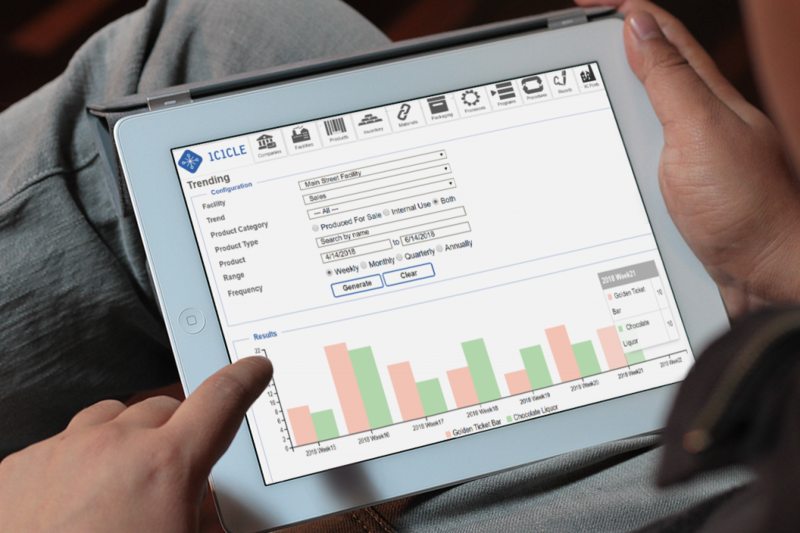 One of the most exciting new Icicle Sales Management features is the Sales Dashboard. Instead of absorbing more sales time with preparing reports, Icicle users – from sales reps to executives – can access the Sales Dashboard and track sales health as often as they want. Like Icicle’s other dashboards, the Sales Dashboard is a single location to track KPIs over the previous 60 days, including sales trends over time, average order size, on-time delivery statistics, customer returns, top customers, top products, and the top salespeople. With a glance, leadership can see whether sales are moving in the right direction and identify which salespeople and which customers are of the highest value. Sales is a critical element of a food company that is often disconnected from the nuts and bolts of production. Icicle takes a holistic approach to food production management with the belief that when communication within an organization is maximized the entire organization benefits. Icicle’s aim in integrating sales with the rest of production and distribution is to streamline everything from purchasing to production schedules, determining appropriate picking, coordinating shipping, and flexibly interfacing with other administrative aspects of running a business. The Purchasing Suggestions feature takes information from Sales Orders and Master Order Forms and allows you to see the required ingredients, materials, and packaging you have on hand and how much more is needed to satisfy booked sales orders and planned production volumes. Purchasing suggestions automatically provide what used to take a Production Manager hours to prepare, and does so with less human error, all while maximizing efficiency and limiting waste. 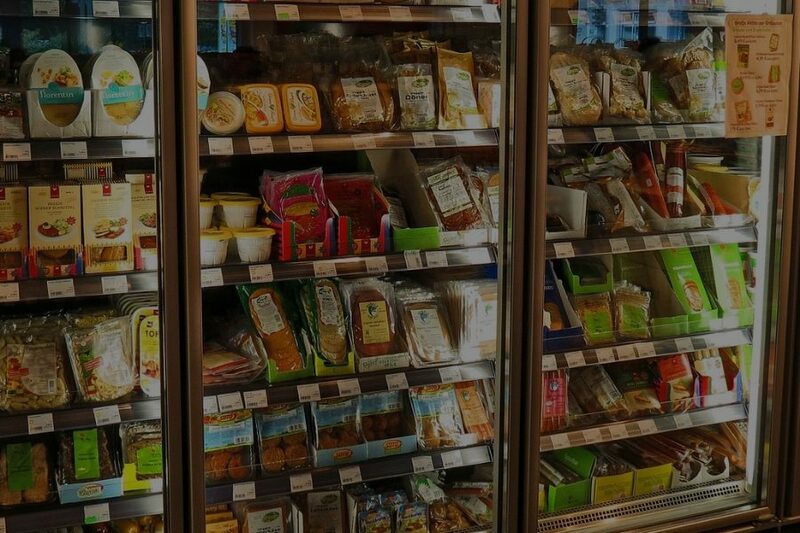 Icicle’s Picking interface was developed with the goal of maximizing shelf life and minimizing product loss due to spoilage, but Icicle’s comprehensive integration has enhanced the Picking feature to work with Sales Orders and Master Order Forms. Picking now makes it possible to fulfill customer orders as efficiently as possible by picking the best products from different warehouse locations and transferring them to one central location, then onto a truck automatically. This Sales Management feature not only saves the sales team from dealing with unsatisfied customers, but it also streamlines shipping, saving time and money across the board, while minimizing human error and satisfying customers with quick and accurate order fulfillment. Customers are evolving. The way your sales team interacts with your customers is reaching higher levels of importance each year: 51% of sales teams rate increasing retention via deeper relationships with customers as one of their top priorities moving forward, followed by becoming trusted advisors (39%), and providing customers with a more personalized experience (37%). These goals are not driven by the sales team’s agenda, they’re driven by customer demand. As customers continue to place more importance on sales interactions, the most successful companies ten years from now will be those who choose today to place higher importance on supporting their sales team. Icicle is looking ahead with Sales Management features prepared to support the successful sales teams of tomorrow – are you?